remember this post? and this painting hanging over our tremendous stacks of dvds? well, it has been replaced with this painting. the beautiful jessica from [under construction] bought it! seriously, she's so pretty. and so sweet. she saw the painting here (on my blog!) and contacted me about buying it. this was my first ever blog in real life meeting. it was really cool meeting a reader (i read her blog too, btw) in person. and it's always really cool when levi sells a painting. this is so much more than a money thing. i love seeing levi validated as an artist. it makes me so proud when people like levi's art enough to pay good money for it and then hang it in their house for all to see. i mean, that's a big commitment. you really have to like something a lot to be willing to look at it every single day. 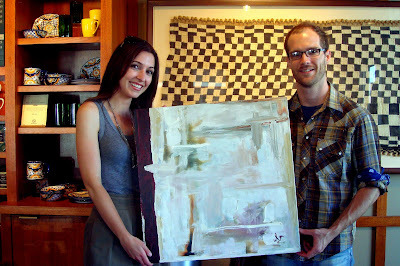 i can't wait to see where jessica and her fiance hang the painting! it is rad! i wish we weren't poor. p.s. loved all your comments from the archives. i am totally self-conscious now, trying to remember what i said back in 2006??? Wow. Love the painting. Love that someone tracked you down through your blog. That's so amazing! How fulfilling for both of you! Wow! Super cool artwork, I love it! 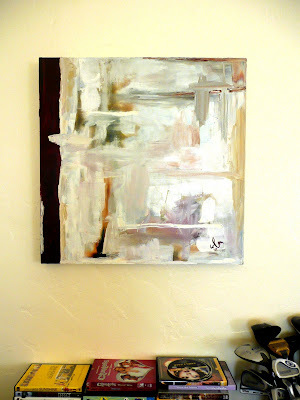 I only buy original art to decorate my home with--I like supporting local, up-and-coming artists! Ah! :D Congrats to Levi! His work really is amazing. No Joke! that's so great! that IS a fabulous painting! Congrats! Beautiful painting, Levi's really talented. So so awesome! Great paintings. Feeling validated for your work really is such a great feeling. that is freakin awesome! i wanna meet a fellow blogger!!!! i am so jealous. that is great that levi's work is selling! congrats! Awe, this is so rad! its hanging by the front door right now making a proper lil entryway. first time i'm around when there is enough light in the apt to get a good shot, i'll share! My parents have been married for nearly 40 years. Back in the days of sit-ins and peace pipes he sold his first painting. When my parents "grew-up" and had the money mom tracked down that first buyer and begged to buy it back AND replace it with a new one. She too took great pride and copious amounts of joy in Da being validated as an artist. These days it hangs above the mantel in their house. He still paints, records his music in a small studio at home and makes her heart flutter when he does. GREAT sale Levi.. all the way around! Fantastic! There is something so wonderful about feeling validated as an artist! That painting is absolutely fabulous! I'm jealous of Jessica. I think I'll go check out the blog of someone with great taste!